For those of you looking at the calendar, you’ll notice that today is March 14th. However, if you convert today’s date to numerals, you’ll realize that today is 3.14, which means it’s Pi Day or Pi(e) Day. Therefore, in honor of Pi(e) Day, we asked a few writers and Boskone friends to share their favorite pi(e) recipes–and they do look tasty. While Pi might be infinite, these pi(e)s won’t last long! We hope you enjoy these recipes and we hope you enjoy Pi(e) Day! Why not have an extra slice to celebrate? Here’s a recipe for my favorite kind of pie — Free Pie. Step 4: The next morning, at your sister’s house/place of employment/synagogue, enjoy some nice Free Pie with your coffee. Jennifer Pelland is the author of the novel Machine as well as several dozen published short stories. Because spare time is for the weak, she’s also a performing belly dancer and occasional radio theater actress. Here’s the 911 on the 3.14! Our favorite pie is peach! Here is the recipe for the New York Times best selling deadline peach pie! Buy a a premade, precooked graham cracker crust. Take the plastic cover off the pie crust without breaking said crust. You may want to get a couple backups. Open can of pie filling and pour it into the crust. Eat it for breakfast, lunch, and dinner until you meet your deadline! I’m a partisan. I like fruit pie, or vegetable if you count sweet potato and pumpkin as vegetables, or pot pie–preferably chicken or turkey. With the exception of key lime and lemon meringue (which are sort of fruit pies), cream pies do not qualify as far as I’m concerned. Brownie pies, peanut butter pies, chocolate chip cookie pies… not pies. Not even food, really. (I make an exception for pecan pie. About once a year.) My favorite is probably strawberry rhubarb, or bumbleberry (mixed berry) pie. Since fruit pies are pretty straightforward, I’m going to offer a recipe for pi(e) crust! It’s based off the recipe in the Boston Cooking School Cookbook (194mumble edition), which was my grandmother’s recipe, but has some technical changes. Her copy of the book is considered a family heirloom (my mother currently has custody), and that is the dirtiest page in the book–a pretty good testament to its quality. Also, the book falls open automatically to that page. Mix the salt with the flour, then work in the butter and lard with your dry fingertips (it helps to chill your hands in ice water first, then dry them) or a pastry cutter. Mix until the shortening is worked down to bits no larger than a pea. If you have a pastry stone to work on, so much the better, but it’s not essential. Moisten the dough with the vodka until it becomes a workable paste, and no further. You can drink any remaining vodka, because nothing goes better with holiday cooking and hot stoves and sharp knives than booze. Try to touch the dough as little as possible while working and rolling it. The purpose of the vodka, the cold, and the minimal handling is to retard gluten formation and keep the bits of shortening pretty good sized, making for a flakier crust! This is the pie that is exactly like a short story in that, no matter how many times you’ve made it before, no matter how fine the ingredients, you don’t know until you cut it in front of guests whether you have a delicious lime pie, a plate of runny slop, or a dish of lime-flavored scambled eggs. The only way to fix it is to go back and make another pie/write another story, because this one plain didn’t work. Heat oven to 300 F. Lightly grease a 9″ pie plate. James D. Macdonald writes fantasy, SF, and horror. He also makes pies. My maternal grandmother, a farm woman, was famous for being able to cut pie into nine equal pieces, freehand. Try it – it’s hard! She became able to do this because there were times in her life when she baked three pies a day and they all got eaten. She had lots of practice and got very good. I am not particularly good at rolling pie crust, but since I went on the low-sodium diet I’ve been practicing more. Here’s a handy tip for pie crust that people will enjoy eating: When the recipe calls for salt, substitute a similar amount of cinnamon, for a sweet pie, or curry powder, for a savory pie. You’ll never go back. For apple pie, peel five or six large tart apples (default to Granny Smiths) and cut into segments. Toss with half a cup of sugar, a dash of nutmeg, a couple of dashes of lemon juice, and a liberal application of cinnamon. For blueberry pie, wash a pint of fresh blueberries, treat same way. Spread more or less evenly in bottom crust, dot with butter, cover with top crust, seal (top crust will be lumpy). Cut slits in pie crust all around. Bake at 350 for 20-40 minutes depending on the size of the pie. When crust is brown and juice bubbles through the slits, take out and cool. Remember, pie is not only a dessert, it’s breakfast food! My favorite Pi is a super easy version of Pecan Pie. This recipe uses absolutely zero corn syrup is is so easy I had my 8 year old niece make it at last year’s Thanksgiving. It’s not super sweet so you can taste the pecans, if that’s something you like. When making for Pi Day, use the decorating pecans to form 3.14. 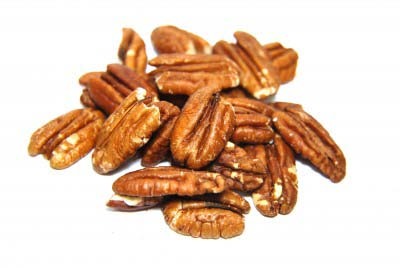 Place halved pecans on top; remember to make fun designs like Pi signs or write out 3.14! Reduce heat to 350 degrees and cook for another 30-40 minutes. This is modified from a recipe my mom-in-law gave me for cherry pie. Mix the flour and salt, cut in the shortening with a pastry cutter, and add water in dribbles. Mix with a fork until it just sticks together a bit. Roll out between two pieces of plastic wrap. Don’t add too much water–the pastry is best while still a little crumbly. Now, the original recipe called for putting the frozen cherries and other filling stuff into the crust and baking. That never worked for me. The pastry got too brown and the cherries took too long to cook. I have much more success by microwaving the filling stuff until it starts to thicken a bit. Then, you can adjust the sugar and flour levels to taste. You can sprinkle a bit of flour and sugar on the bottom crust, to keep it from getting soggy. Cover with the top crust and cut a few holes for the steam to escape. Deborah Lynn Jacobs’ most recent book is Choices, written for the twelve and up crowd. Here’s the tag line: Kathleen, overwhelmed with guilt over the death of her brother, shifts between alternate universes in an unconscious attempt to find one in which he is still alive. Any good Boskone Pi(e) post deserves a recipe for Boskone Cream Pie. I moved to Boston about 10 years ago, and I fell in love with the region’s famous pie. However, since I am lactose intolerant, my stomach often protests. So, I invented my own lactose free recipe and being the sci-fi chick that I am, I dubbed it the Boskone Cream Pie. The instructions are pretty simple. Buy a Betty Crocker yellow cake mix. Follow those directions to make one round cake. Once it’s done, let it cool and then slice it in half. Remove the top half of the cake and smear the vanilla pudding on the surface of the bottom piece of cake. Then replace the top half of the cake, leaving a nice thick layer of pudding between the two halves. Open your container of Betty Crocker Chocolate Frosting (or whatever brand you prefer), and smear it on the surface of the top layer of cake. Cut into your newly made Boskone Cream Pie and enjoy Pi(e) Day! 1 Response to Happy Pi(e) Day from the Boskone Community!